How 'Crunch Time' Between School And Sleep Shapes Kids' Health : Shots - Health News A new poll explores how crucial everyday decisions are made in American households about food and exercise. To understand why, NPR conducted a poll with the Robert Wood Johnson Foundation and the Harvard School of Public Health. It focuses on what happens in American households during the hours between school and bedtime. This is crunch time for most families — when crucial everyday decisions get made about food and exercise. Our poll used a unique design to get at what is actually happening in the life of a "target child" in each household. We supplemented their responses with more than 800 that came in when we asked parents, through NPR's Facebook page, to describe their own "crunch times." The most striking finding is that U.S. parents "get it." When we asked a parent or other principal caregiver in our poll how important it is that their child eats and exercises in a way to maintain a healthy weight, more than 9 in 10 said it was important — and most said it was "very important." But all too often, there's a disconnect. Despite good intentions, it's not happening. More than half of children ate or drank something during the "crunch time" window that can lead to unhealthy weight gain, as perceived by their parents. And more than a quarter of children did not get enough exercise, their parents say. "It's hard enough to get dinner on the table while trying to help them with homework," says Paige Pavlik of Raleigh, N.C. "Once we do everything, there is absolutely no time to go outside and take a walk or get any exercise. It's simply come in, eat, sit down, do homework, go to bed." The relentlessness of it makes her emotional. Pavlik starts to cry as she talked about her family's daily crunch time. "It's really hard," she says. "This isn't how I thought family life was going to be." Nearly half the parents in our poll say it's difficult to make sure their child eats healthy. Lori Bishop of Lexington, Ky., says she tries to excel as a parent and as a full-time laboratory manager. But she ends up feeling mediocre at both. Both she and her husband have stressful jobs, she says, and often feel exhausted at the end of the workday. "But you gotta go right to work in the kitchen," Bishop says. "And while I would love to prepare a well-balanced meal each evening ... it doesn't happen." She says dinner at the Bishops' house is often pre-packaged meals — "things that are frozen that you can heat up like frozen pizza, frozen chicken nuggets." More than 9 in 10 parents said it was important that their child eats and exercises in a way to maintain a healthy weight. 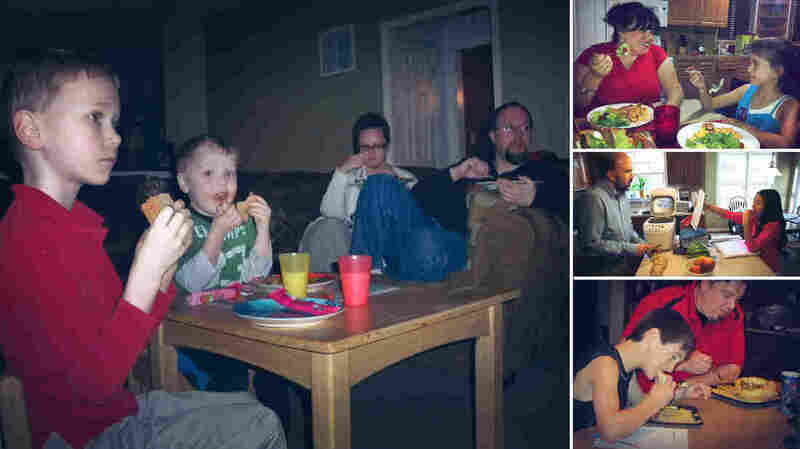 In three-quarters of the households polled, most of the family ate dinner together the previous evening. And of those, most said the "target" child's dinner was prepared at home with fresh ingredients. But about a third of children who eat at home with their families are like Lori Bishop's kids — they end up relying on pre-packaged, frozen or take-out food. And nearly half of those in our poll say it's difficult for families to eat together on a daily basis. Adam Jacobs' family in Mesa, Ariz., is a case in point. He and his wife have long commutes to work. "My wife and I don't even get to talk about our days," he says. "If I have something to tell her, I literally put it on my smart phone to remind me." Their two boys, who are 14 and 10, usually have after-school activities. On one recent evening, Jacobs tried to rustle up dinner for himself and his older son. "I was at home at 7:30 and it was ready by 8:30," he says. "And by that time, my wife and younger boy weren't even home yet and my older son had already eaten ... so it wound up just being another solo deal." It's not just time that's in short supply. Among the parents we talked to who say it's difficult to prepare fresh foods, money was also a factor. Araceli Flores and her two young children live in the farm belt of central California, surrounded by fields of broccoli, cauliflower, asparagus and fruit orchards. But she says it's too expensive to buy fresh foods. "I can buy a box of macaroni and cheese for a dollar," Flores says. "A bunch of bananas – like a good maybe week-and-a-half's worth of bananas — will cost me over a dollar. Strawberries are four dollars. Apples, a bag of apples, is going to cost me five dollars — way more pricier to buy vegetables and fruits than it is to buy boxed food." And it's not just time and money that get in the way of doing the right thing. Parents say there are other barriers — such as their physical surroundings, school lunch policies, and their family's culture. Vanessa Benavides is a single mom in Miami who's Cuban-American. She comes from a family with nutrition-related health issues. "Most of my family is overweight," she says. "Most of my family has high blood pressure. My father's diabetic." On weekends, Benavides fills up her grocery cart with fresh fruits and vegetables. She intends to cook healthy meals, she says. But at the end of a long day when she picks up 7-year-old Emily at her mom's house, it's often easier to eat the dinner that her mother has made. "Once we do everything, there is absolutely no time to go outside and take a walk or get any exercise. It's simply come in, eat, sit down, do homework, go to bed." "It's a lot of Cuban meals," Benavides says. "You know, it's just a lot of rice-meat combinations that are often fried or greasy." And then Benavides' mom and dad keep urging Emily to eat more. "They want to fatten her up," she says. That bothers Benavides, because she was once a skinny kid like Emily. But now she struggles with her weight. "They were always trying to tell me to eat more and eat more and eat more," she says. "You know, a nice chunky kid is [considered] healthy in our culture." Parents often say schools are undermining the messages many parents are trying to give their children. In school cafeterias across the country, kids are still eating dense, high-fat and over-processed food for lunch. Assonta Wagner, one of our Facebook respondents, lives with her husband and four children in Alamogordo, N.M. Her kids typically take their lunch to school. But sometimes she allows them to eat school lunches. And when they do, she cringes. "One of their favorite meals was this mashed potato bowl," Wagner says. "It was mashed potatoes, little fried chicken pieces and corn. And then they covered it in gravy." She's a stay-at-home mom who's super-conscientious about making healthy food at home — lots of fruits, vegetables and lean meats, no pre-packaged foods, no instant meals, no soda. So what's offered at school is particularly upsetting to her. And it's not just the lunches. At Halloween, Thanksgiving and other holidays, they get bags of candy — even her overweight son — as a reward for doing a good job. And when all those calories add up over the years, parents say the very environment they live in makes it hard to reverse the problem. Some parents say it's too hard — or too expensive — to get their children to a safe place to exercise. That's one reason one poll respondent, Vivian Carter-Smith, is so worried about her 17-year-old grandson. "He's a good boy," she says. "He's overweight. He's short ... and I know he weighs 350 pounds easy." She says her grandson doesn't get any exercise. He stopped going to the "Y" when other boys teased him about his weight. And Carter-Smith says there isn't a place near his Cincinnati home where her grandson and his younger brother can even get outside and walk. And in fact, they don't want to. "The way the streets are," she says, "with these kids with no parents and no rules and regulations and upbringing skills — they are scared." But she knows that a lack of exercise combined with an unhealthy diet can lead to disaster. After all, her grandson's father died last year of a heart attack – at the age of 38. This story is the first of eight parts in the series On The Run: How Families Struggle To Eat Well And Exercise. The series is based on a poll from NPR, the Robert Wood Johnson Foundation and the Harvard School of Public Health. If you want to dive deeper, here's a summary of the poll findings, plus the topline data and charts.